After threatening to ditch the tablet hardware business entirely, Barnes & Noble is now threatening to unleash a new model on unsuspecting consumers, just in time for the summer vacation season. Mashable reported on B&N's fairly bleak third quarter financial results for fiscal 2014 today, but the real news turned out to be a brief mention of a new "color tablet" on the way. Although company executives declined to offer further details during the quarterly earnings call, the mere fact that Nook hardware is alive and (relatively) well is likely to be music to the ears of its e-reading customer base. After failing to launch any new tablet hardware in 2013 aside from the black-and-white Nook Glowlight, the company's latest model is expected in "early fiscal 2015," which equates to late May or early June 2014 for those of us on the traditional Gregorian calendar. 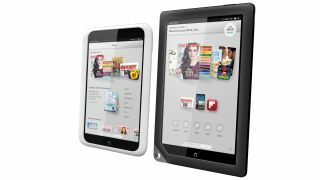 For those keeping score, it's now been two years since Barnes & Noble launched the Android-powered Nook HD and Nook HD+, which feels like an eternity in the consumer electronics world. Instead of focusing on splashy new hardware, the retailer instead focused on blowing out existing inventory over the holidays, creating more stock from what executives referred to as "previously acquired parts and components." Ironically, Barnes & Noble continues to do brisk business with physical books, apparently at the expense of Nook e-book sales, which were largely flat last year. Barnes & Noble Chief Executive Officer Mike Huseby is confident in a Nook turnaround, but with all the back and forth, it may be hard for the new Nook to catch on. Can't wait for summer? Check out TechRadar's list of the best tablets!